Chances are, the graphical depiction of Earth’s land masses and oceans you’re most familiar with is the one shown below. Developed in 1569 by a Flemish cartographer named Gerardus Mercator, it’s the most widely-used map projection of our planet. There’s just one problem: it’s wrong. Alaska and Brazil are portrayed as being similar in size, but in reality, Brazil is five times the size of the northernmost U.S. state. Greenland looks like it rivals the entire African continent in size, but actually has roughly the same surface area as the country of Algeria. It’s not that Mercator had a poor grasp of geography; it’s just that when trying to represent the surface of our three-dimensional planet on a two-dimensional plane — a process called projection — something always gets lost in translation. The Mercator projection exaggerates the size of land forms at the poles while diminishing the size of those nearer the equator. In trying to correct for proportion, other cartographers have sacrificed perspective. 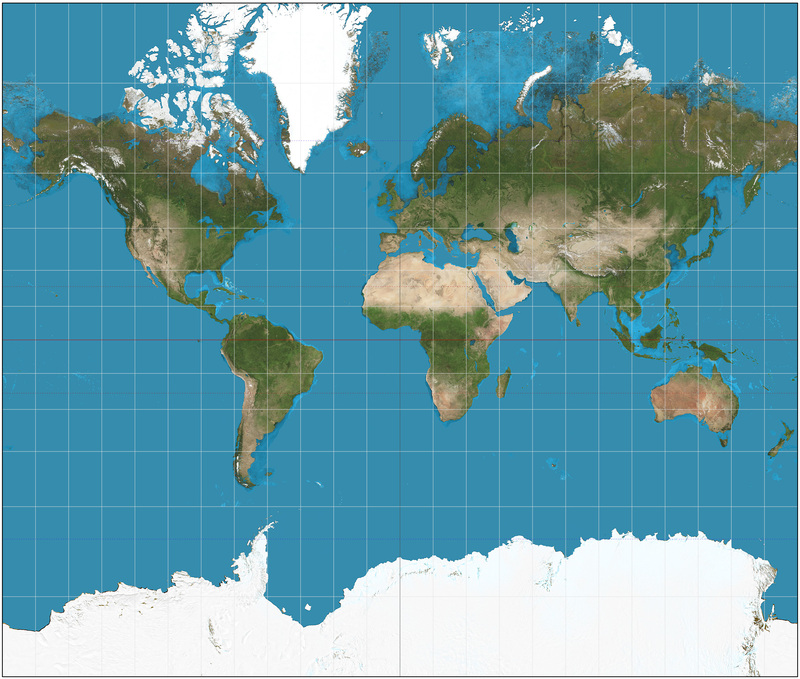 The Lambert cylindrical equal-area projection depicts the Earth as short and wide, the Gall-Peters projection tall and long. Enter Mark Jeffery. The Rossland, B.C.-based software developer and self-professed map geek behind goodwoodglobes has a simple solution to the problem of distortion: let the Earth be round. But not just any globe. Jeffery wants to create wooden globes with the continents, oceans and mountain ranges carved in relief on the surface, so you can feel as well as see the geography of our planet. For the past two summers, Jeffery has used a computer numerical control (CNC) machine — essentially a tooling machine that carves a piece of material to precise specifications by following programmed instructions — to create prototype relief maps, and he’s now experimenting with the best way to fit the pieces together. Carved from maple wood, the globes are meant to be both beautiful and functional. “You’ll be able to pick it up and turn it in any direction, and I think that kind of perspective on the place that we live is super valuable and educational,” Jeffery says. The biggest hurdle Jeffery faces in bringing the globes to market is getting enough time with the CNC machine. It’s housed at the MIDAS FabLab, a makerspace and digital fabrication training centre in nearby Trail, but getting there from Rossland in the snowy depths of a mountain winter can be challenging and even dangerous, so Jeffery has launched an Indiegogo campaign to raise $5,000 — about a third of what he needs to purchase his own CNC machine and have it delivered to his door. “If I get that, I’ll find a way to get the rest of the money together, but my hope is I’ll make enough to really kickstart this whole process,” he says. In exchange for a pledge to his campaign, Jeffery is offering various perks ranging from a simple thank-you note carved in plywood, all the way up to a fully-realized, 12-inch diameter globe, which he expects to be able to deliver by August 2020.